After playing the piano for 30 years, but never owning an acoustic piano, I decided to put that right this year. I spent several months shopping around as far as Manchester but I never walked away from a piano retailer feeling completely satisfied either with the piano or the service provided. Having heard of Ben Wheeler pianos, I decided to try Ben’s showroom out for size. I placed a call and spoke to the lovely Michelle who listened attentively to my situation and offered an appointment that weekend. I explained that I was a little rusty having not played for some years but I enjoyed playing JS Bach. When we arrived, my partner and I were warmly received by Michelle who had dug out a piece by Bach which I dropped in to our earlier conversation that I could play. This was a great gesture by Michelle as it allowed me to play within my comfort zone so that I could truly experience the pianos. Armed with the score and a lovely cup of tea, I pottered around the showroom under the guidance of Michelle who explained the different pianos, sounds and brands. Whilst Michelle was always on hand to help and answer any questions, there were absolutely no pushy or aggressive sales techniques which I had encountered at previous showrooms. The showroom and time was mine to do as I pleased which was fantastic. 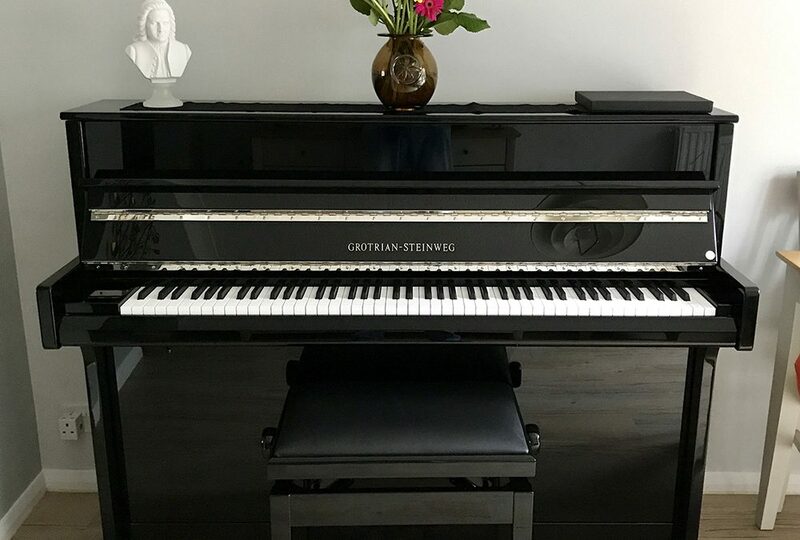 After playing one bar of music on the Grotrian-Steinweg Cristal I was hooked. I asked whether some modifications could be made; a chrome finish instead of the brass and blue felt on the keyboard. Nothing was too much trouble and any requests granted with ease and a smile. Michelle also arranged for me to have an afternoon on my own in the showroom whilst my piano was on order to try out and practice on the other pianos. Ben and a Michelle also sourced a bust of my favourite composer JS Bach from Germany which was shipped with the piano. The piano was delivered on time by Ben and Neil who placed the piano in it’s new home and cleared everything away. The delivery was professional, prompt and my home was left with absolutely no mess or trace of the delivery. I now regard both Ben and Michelle as good friends. I can not recommend Ben Wheeler pianos enough. Ben and Michelle are a delight to deal, truly passionate about all things piano, and I’m delighted that my search for a piano ended three miles from my home whilst supporting a first-class local business. Thank you Ben and Michelle so very much. I am absolutely thrilled.